E! hostess and celebrity mom Giuliana Rancic shares her ideal date night and talks about everything from marriage to career to competitive snuggling. In a guest post on iVillage, Giuliana gets candid about not valuing "material things", how she balances career and family, and how she keeps her marriage strong. 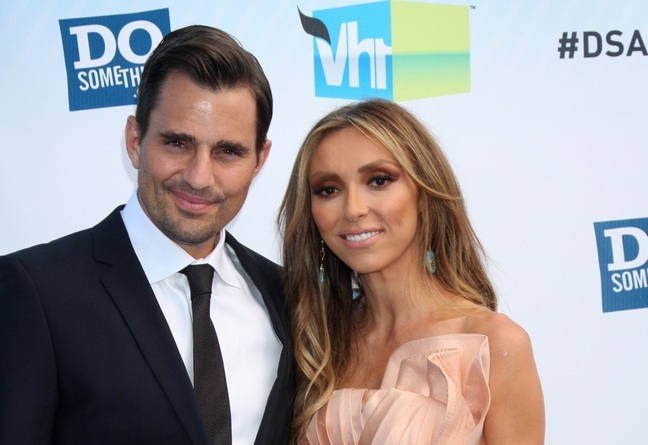 Giuliana on putting marriage before baby: A lot of people would say to me, “Oh, you've said this statement and I'm sure you were misquoted,” and I said, "No, I wasn't misquoted at all.” [Laughs] You know, I'm pretty direct person. And that's what I meant. I think it's so incredibly important to put your marriage first. Your marriage is the first example your child sees of a relationship, so in our case, we want Duke to see us kissing and dancing and loving each other and respecting each other, so that he can go into his life and into his future and respect women and respect others or just be a respectful person and a loving person. I think that so many people put their marriage second. And I think, in the end, it's detrimental to their relationship as well as their children. Your kids want to see you in love. They feel safe when you're in love and when you're good to each other, so I think that's very important. Giuliana on discovering snuggling is a competitive sport: Bill and I joke that we’re always competitive in sports and working out and we’re even competitive with who gets to see the baby first in the morning. Bill, I discovered recently, is a baby hog — but that is a good thing. You want a husband who loves being with the baby. Giuliana on redefining date night: Our idea of a date night is once the baby is asleep, getting carry out, you know, getting food delivered or making food at home, just something simple. Then we go to bed early and watch TV and cuddle. The date night isn’t some elaborate fancy evening where you have to spend a lot of money and put a lot effort into it. I think it’s just redefining the term date night, because date nights are important. But more than spending money, it’s really about the conversation and connecting and the time you spend together. Giuliana on how “I love you” is more than words or a little blue box: Listen, I love a pair of gorgeous shoes, but that’s not what I expect from Bill every month as a gift. What shows me he loves me is that every morning he wakes up and makes my coffee. There’s a secret thing [he does] with my milk that makes the coffee taste amazing. It speaks volumes, and it’s a cup of coffee. I think for a lot of us, it’s like, unless it’s expensive or it’s in a blue box with a bow on it, it doesn’t say “I love you” enough. And I completely disagree with that. You have to do little things for each other, things that really speak to the soul, [things] that involve making each other’s lives easier or more pleasant, and just making each other happy. And you know, that’s what it’s all about it. Giuliana on how she’s learning to juggle her career and motherhood: I was spending a lot of time at work thinking about the baby and shopping for the baby. Then I would get home and I would be playing with the baby and then the next thing you know I’d be checking my emails because I neglected things at work. And then I wasn’t having quality time with the baby. I was only giving work 50 percent and the baby 50 percent. And I realized the secret, at least for me, is when I’m at work, I work. That’s it. I focus 100 percent at work. And when I get home, the phone goes away and I focus 100 percent on baby time. I found that it really helps balance things more than it used to. Giuliana on finding herself on worst-dressed lists: I always say, to be a true fashionista, you have to be on the best-dressed list and the worst-dressed list because it means you’re taking chances. If you’re always only on the best-dressed list, you’re not having fun. You’re not taking chances. You’re not trying new things. Yeah, I think it’s hilarious. … And to do a show like ‘Fashion Police’ and being on the red carpet talking about fashion all the time, if you’re going to dish it, you need to be able to take it, too. Mega Photo Gallery: Red Carpet Fashion At The 2013 MET GalaDaniel Gillies and Rachael Leigh Cook Are Expecting Their First Child!